Form validation is an important thing we nee to do while creating a web based form. In early days, developers used server side form validation. Then it came client side form validation. Now with HTML5, we can easily validate a form. All modern browsers supports HTML5 form validation. Although HTML5 has field validation feature, there are many developer who still do not know about this and use jQuery validation. In this, post I will describe how to use HTML5 form validation in your web application. For, client side validation, HTML5 introduces various kind of new INPUT elements with validation attributes Below, I will explain all input types and attributes. For validation, you need to use proper input type with attribute and pattern. Here pattern is used to define a pattern of accepted values. It is optional but you need to know how to use it properly. Similarly you can use other HTML5 input types. search – It behaves like a regular text field but used for search box. week – The week type allows the user to select a week and year. This is the attribute which must be add in the INPUT field if you want its value to be validated. 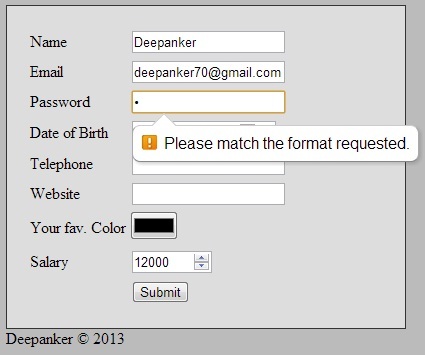 If you add required, user must input some value in the field in order to submit form. If you add required, it informs web browser that the field is mandatory. You can use this to al fields which are mandatory. This pattern is used while validation. see the pattern for URL input type. Now see the password field validation below. If you want to take a look on a form with most of the validation, see the code below.